A delegation led by former Rear Admiral Sarath Weerasekara is to leave for Geneva on Wednesday to attend the 35th session of the UN Human Rights (UNHR) Council. He said they intend lobbying in favour of Sri Lanka and to handover a petition against UN High Commissioner for Human Rights, Zeid Al Hussein for interfering in the internal affairs of a sovereign country. The petition is to be handed over to the President of the UNHRC, Joaquín Alexander Maza Martelli. Mr. Weerasekara said Mr. Hussein had interfered in Sri Lanka's internal affairs by defaming its judiciary and calling for constitutional reforms as a means of providing a political solution to the national question. “The High Commissioner is calling for a hybrid court in violation of our Constitution. Therefore, we demand a public apology for making false accusations and interfering in our internal affairs,” he told a news conference organised by the Federation of National Organisations. A country is represented by it's foreign ministry. In Sri Lanka there are people who want to show the world that the democracy is practised to the out most. BUT unfortunately these oppositions go and screw up many things without informing the present government and further they are creating havok at Geneva without approval of the present government. No wander the world body at Geneva could just conclude that SRI LANKA HAS NO PEACE YET !!!!!! Dear Sarath pls. accompany Gaalgoda Thera with you when you attend UNHRC and confront with them saying that what ur countrymen are currently carrying out on our motherland is correct and it is sri Lanka's internal affairs and say UNHRC has no right to interfere in their matters.We need your type of leaders for our country. hoorray! Mr.Weeraseka,why don't you rent out an apartment in Geneva,then it's easy for your matters. Please don't waste your time,do something worthwhile for the country. Please do your best to show the anti Sri Lankan attitude of the UNHR chief and some others. Request UN to allow us to handle our internal issues within the local law. They can talk if that fails. Good luck. 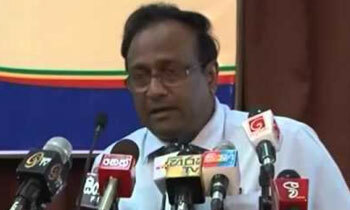 well done sir you should be the srilankan foreign Minister. not the one who did that job earlier and the one who is doing that job now. You R a real srilankan son with a real hard educated back bone. non of the srilankan leaders has a strong back bone like one U R having to talk against the false allegations against this beautiful island. pl. accept our nations Salute for the painstaking service you did and doing for this country. May God protect and Bless you and your endeavour to prove the world our innocence. A sole warrior, swimming against the tide! Hat off Sir! The best way a criminal can hide his criminality is by accusing everybody around him as liars and criminals. Kalu gala oluwa gahaganne yanawade? or Joy ride?